I am looking forward to the upcoming Miss Africa USA Pageant that will take place in Silver Spring, Maryland on July 24, 2010 from 6p – 11p. The contestants are young women from African nations that are living in the United States. The goal and purpose of this beautiful event is to shine a spotlight on these African Queens and offer an inspiring occasion not only for the delegates but for the world! Although the Miss Africa USA Pageant has been in existence since 2005, this is the first year I am aware of its existence. The Miss Africa USA website describes the pageant as ” the biggest and the most publicized pageant that features African Queens in USA today.” The winner of the pageant will receive a scholarship, trip to Africa, a luxury vacation and more! The Miss Africa USA Channel offers video interviews with the finalists. Each contestant has specific humanitarian goals that she discusses within the video! How awesome to see these strong, positive young women so focused on helping others! It gives me GREAT hope for the future! We must all find ways to support this pageant and these women! 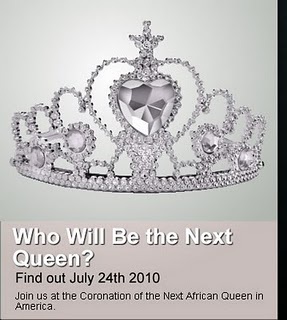 The pageant will be aired on the Afrotainment Channel on Saturday July 31, 2010 at 9pm EST. 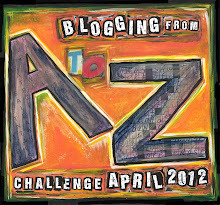 I am still searching for live streaming availability …..if I find it I will surely update this post!! Be sure to stop by the Miss Africa USA website to vote for your favorite finalist and be sure to vote for the host city for 2011. If you are lucky enough to have tickets and are attending ….Please share the DUAFE with us….post your pictures (or links) here!